Please note that the minimum order quantity is 100 units. The price per unit is $120. The lead time is approximately 4 weeks. An ever-wider array of devices and the increasing pressure to minimize costs means that you need to get the most out of your embedded systems interface tools - and the Aardvark™ OEM I2C Host Adapter is expressly designed to enable your competitive edge. Based on our flagship Aardvark™ I2C/SPI Host Adapter, the Aardvark OEM I2C Host Adapter is a low-cost, easy-to-use, easy-to-bundle USB-to-I2C interface. It helps you to focus on core competencies by deploying your solutions with minimal engineering overhead and allows your end-customers to easily interface with your downstream embedded system environment. Not using I2C? 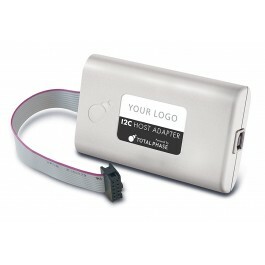 Please visit the Aardvark OEM SPI Host Adapter product page. Is it possible to multi-task the Aardvark I2C/SPI Host Adapter as multiple I2C slaves with separate slave addresses? Can I Really Automate Jobs with My Aardvark I2C/SPI Host Adapter and XML Batch Scripts? How Do I Send Data to the I2C Master Device when the Aardvark I2C/SPI Host Adapter is Set Up as the Slave Device? How Can I Use the Aardvark I2C/SPI Host Adapter in Slave Mode with a Master I2C Device under Test? Are there Specifications or Limits when Utilizing Multiple Aardvark I2C/SPI Host Adapters in One System? How much power can be delivered to downstream devices like I2C and SPI EEPROMs from the USB port when using the Aardvark I2C/SPI Host Adapter? How Can We Utilize the Aardvark I2C/SPI Host Adapter as an I2C Slave with an Embedded Device on a Development Board?